There is good news for sports car enthusiasts. Toyota is back in the game! 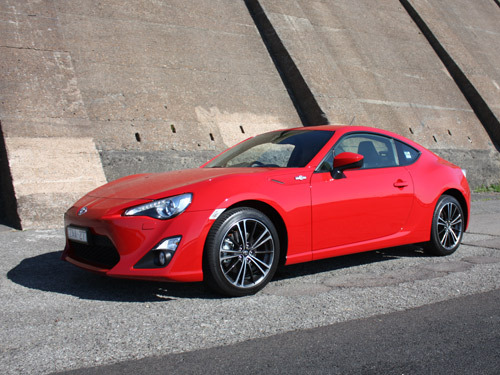 On this occasion, we drive the highly desirable Toyota 86 GTS automatic coupe finished in Mount Fuji Red. Two grades are available. The entry level GT is priced from a very reasonable $29,990* whilst the GTS is priced from a still reasonable $35,490*. An automatic transmission adds $2,500* to the price of both variants. The test car is priced at $37,990* being an automatic with no accessories fitted. The GTS gets bigger wheels than the GT as well as bigger brakes, climate control, satellite navigation, leather and Alcantara trim, keyless access and start and LED daytime running lights. After a long absence of a true sports car from their range, Toyota has teamed up with Subaru to design and manufacture the 86. 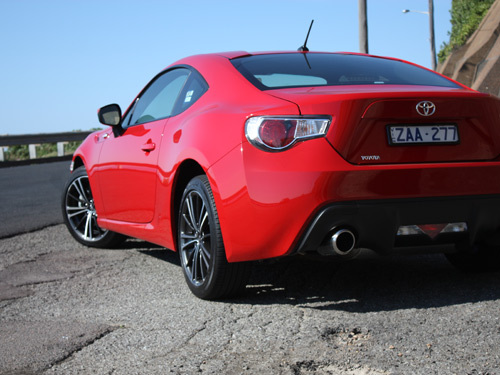 The Toyota 86 is powered by an all-new two-litre horizontally opposed four-cylinder boxer style petrol engine. The statistics are relatively modest for a modern sports car with maximum power being just 147kW and peak torque of 205Nm. It is high revving though with maximum engine speed of 7,450 rpm. Peak power is delivered at 7,000 rpm and the peak torque band is from 6,400 rpm to 6,600 rpm. Despite its size and low power output, putting the foot down to open the throttle produces performance that will more than just satisfy. 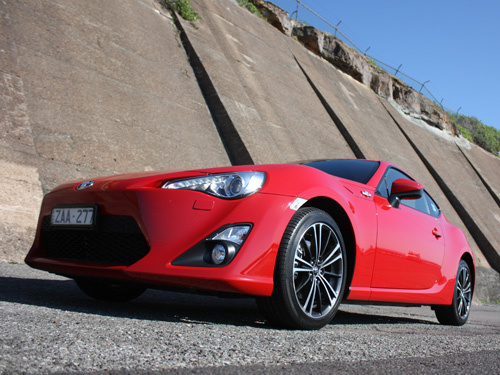 Power is put to the road via the rear wheels which adds to the appeal of driving the 86. The wheels are small by sports car standards. The GTS gets 17 inch alloys riding on 215/45 R17 tyres with the entry level GT getting smaller 16 inch rims. The 17’s are the perfect size and compliment the firm but not overly stiff suspension perfectly. Ride quality is very good around town. You’ll still feel the bumps but you shouldn’t need to visit the chiropractor. Road holding whilst cornering is excellent. 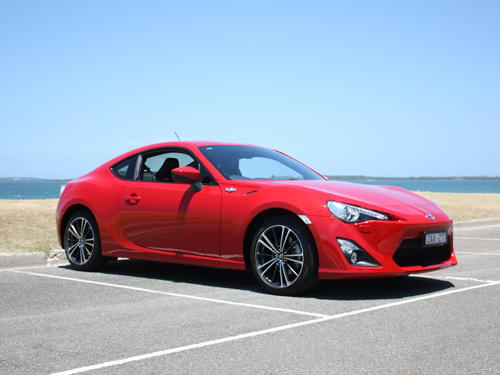 Outright acceleration is not high with acceleration from zero to 100 km/h taking a claimed 8.2 seconds in the automatic (7.6 seconds manual) and the 86 auto will accelerate on to 210 km/h (226 km/h manual). The throttle is very responsive, allowing keen acceleration and producing wheel spin surprisingly easily. Grip from the rear drops when cornering at low speed and requires a bit more care with the accelerator. Toyota admits that a higher performance tyre package will give owners a decent performance gain and if its track use you want this car for, we agree but around town we’d stick with the standard package. 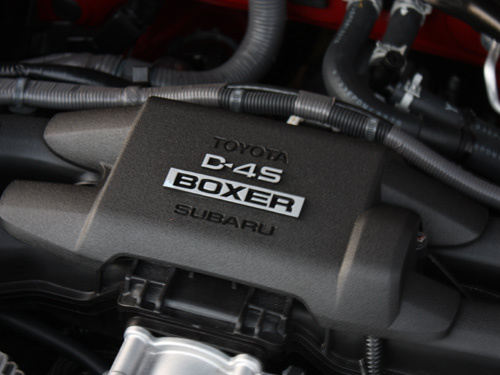 The boxer engine and exhaust strike a sporty note, particularly at higher revs making the 86 even more enjoyable to drive. 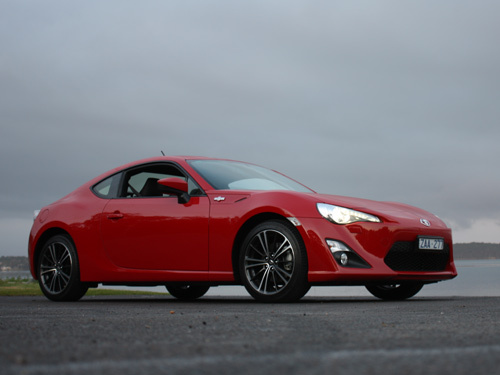 The automatic transmission comes with steering wheel mounted paddle shifters and we’re pleased to say that paddle shifters are a plus on the 86 – good fun on the down shift. 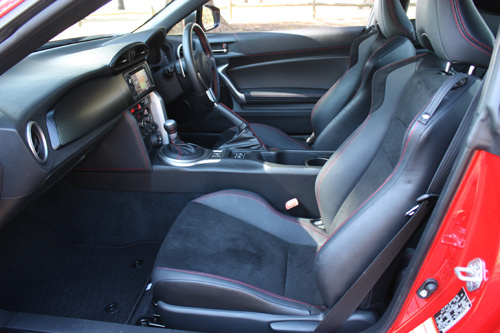 The interior of the 86 GTS has touches of class. The frameless rear view mirror is impressive and a world first design feature that is likely to be copied in other cars in the near future. The steering wheel is small – it has the smallest diameter in the Toyota range. It’s still reasonably chunky and feels comfortable to grip although it looks a little bare due to the absence of audio or telephone buttons. Toyota insists that the interior design objective was to provide a clutter free cockpit to ensure the driver is at one with the car. It’s certainly clutter free when compared to most modern vehicles. The sceptic may say cost control has a big influence too. The front seats are excellent. They look great thanks to Alcantara trim and hug the body well. They were comfortable around town and on longer journeys. The GTS gets heated front seats too. You are seated low, mostly because the 86 is a low car and the design has targeted a low centre of gravity for maximum performance benefit. The driving position is comfortable but access may be challenging for tall people or people with reduced mobility. As advertised, the 86 is a four seater but in reality, capacity is just two adults. The rear seats cannot be sat in if the fronts are occupied as there is absolutely no leg room left. They are handy for storage though, as the boot is tiny. 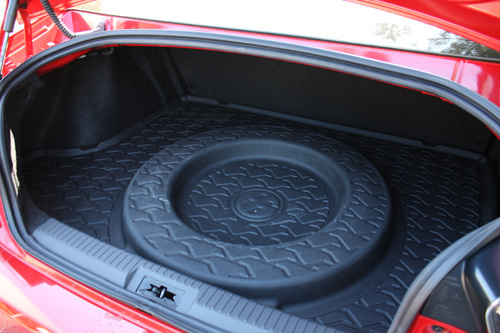 The GTS boot is even smaller than the GT thanks to the plastic donut rising from the floor of the boot to accommodate the full size spare which is stored below. The boot capacity is 218 litres. The back seat can be folded to increase storage and it must be if you have slightly bulky cargo, eg golf bag or suit case. The GTS is well equipped with standard satellite navigation integrated into the audio system which is controlled via touch screen. The system has Bluetooth telephone and audio connectivity. Unfortunately this system is not well designed – the navigation often screams out “GPS signal lost” and the touch screen is disappointingly unresponsive. Keyless entry and start are standard on the GTS – with the start button being located sensibly near the gear stick. Dual zone climate control is also standard kit on the GTS and works well although some of the switch gear for the climate control feels cheap. Other technology includes electric folding mirrors but unfortunately they are not automatic. So with a few negatives, our opinion of the interior is still overwhelmingly positive thanks to the quality seats and overall equipment levels. 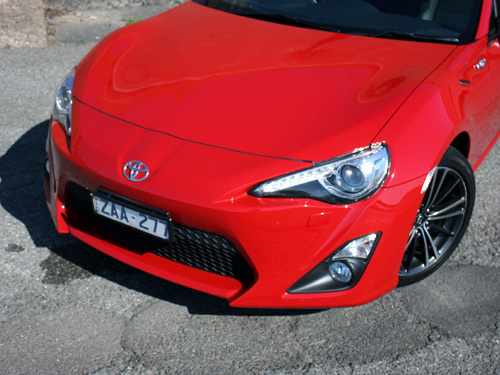 Yet to be rated by ANCAP, Toyota anticipate a five star rating when the 86 is tested. The Subaru BRZ has been tested and given the maximum five star rating. The Toyota 86 gets seven airbags plus a host of electronic driver aids including anti-lock brakes with brake force distribution control and brake assist, traction control and a five mode vehicle stability control. It’s worth noting that the increased grip and manoeuvrability are safety features that will help avoid accidents which may be unavoidable in less agile cars. 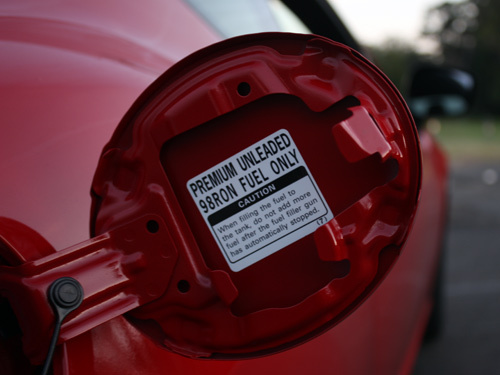 Importantly, the 86 must be filled with premium unleaded fuel, 98 octane or higher, which will add to your running costs. The 86 automatic should achieve fuel consumption of 7.1 litres per 100 kms on a combined cycle as per Australian Design Rule 81/02. Considering the small engine and low power output, this level of fuel consumption is on the high side but is reasonable for a sports car. We managed consumption of 8.4 litres per 100 km over 606 kilometres with approximately 50% of our driving in the city and 50% at freeway speeds, always using the air conditioning. When fitted with the manual transmission, the 86 uses 10% more fuel on a combined cycle with the consumption rating rising to 7.8 litres per 100 kilometres. Emissions are claimed to be 164 g/km for the auto and 181 g/km for the manual. 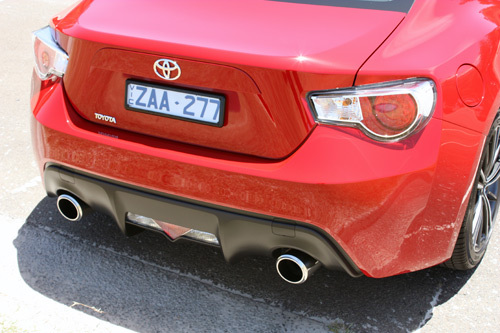 All 86 models have a 50 litre fuel tank capacity. Service intervals are 6 months or 10,000km. 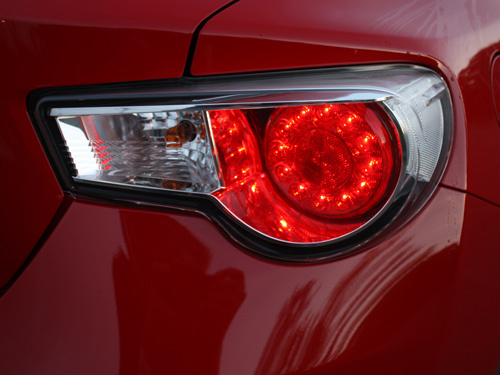 The 86 is covered by Toyota’s capped price servicing plan which limits up to six logbook services to a maximum of $170 (current price). This covers the first 3 years or 60,000 kms from new, whichever occurs first. With waiting periods stretching to late 2013, this is a tough car to get hold of and we don’t like your chances of haggling for a discount with your local dealer. But it is a true driver’s car that is worth the wait, especially at its current price. In the meantime if you cannot wait, we suspect plenty of 86’s will change hands on the used car market at small premiums to the new car price. And there will be dealer demonstrators hitting the market too.